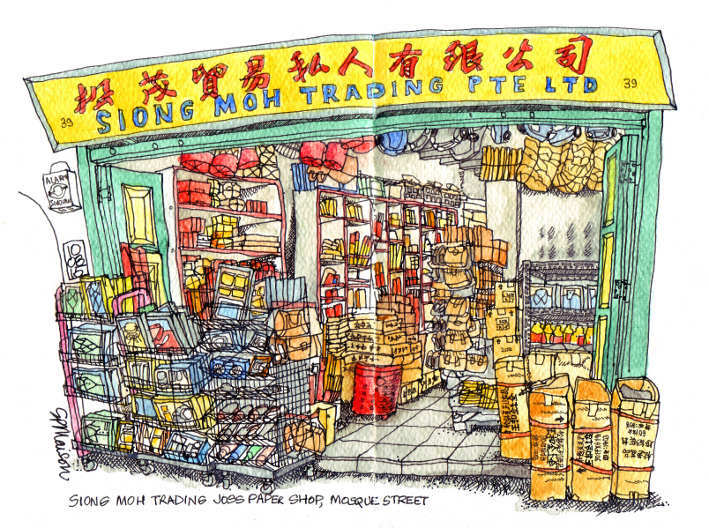 My final weekend in Singapore ended in front of a shop I have wanted to sketch for many months. 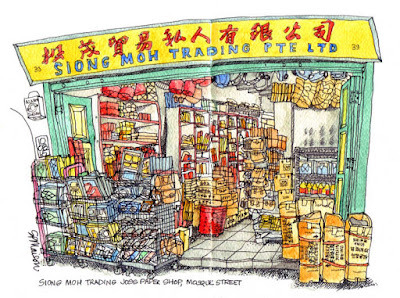 Joss paper shops in Singapore sell candles, joss sticks, oil and papier-mâché items to offer to the deceased at funerals and special occasions such as Qing Ming (Tomb-sweeping Day) and Zhong Qiu Jie (Hungry Ghost Festival). Siong Moh Trading stocks bundles of money, credit cards and cheques, denture sets, six-packs of beer, gold and silver bullion, shaving sets, jewellery, watches, iPhones and iPads, medicines, make-up, handbags, shoes, shirt and tie sets, cars, cigarettes, houses, facial treatments, radios, cassette players and gambling sets. The shop closed at 5pm, so I had to return on the following day after work. This was my last night in Chinatown - I strolled to the hawker centre for a final meal. I am going to miss Chinatown. I am going to miss Singapore. I will miss Asia. If only I had started drawing a few years ago, I would have had so many more memories. where are you off to? We head back to Oman in a week. Sub......we're back in England. We moved to a stone cottage in Surrey where Mrs M spends her days talking to her chickens while and I sit in horrendous traffic jams learning Mandarin to distract me from the thought of going into the office. How long are you staying in Oman? Sounds quite lovely! We will be in Oman for the next 2-4 years, perhaps you and Mrs M would like to come for a visit / victory lap? We have the space! Looking forward to your sketches from England.